Abstract: The number of students taking online courses in K-12 has increased exponentially since the inception of virtual schools in 1996. However, K-12 virtual schooling is a relatively new concept for those involved in teacher education. As teacher education departments build pre-service preparation programs, in-service professional development opportunities, and state-wide endorsements and certifications, they will need to do so with a firm grasp of existing standards and practices within the field. This paper describes several major attempts to form standards and best practices. In doing so, it also explores the research backing and the need for additional research to support such standards. The paper concludes with a discussion about the various roles future teachers might play in virtual school work and the associated standards that would guide their instruction. Ferdig, R.E., Cavanaugh, C., DiPietro, M., Black, E.W. & Dawson, K. (2009). Virtual Schooling Standards and Best Practices for Teacher Education. Journal of Technology and Teacher Education, 17 (4), 479-503. Waynesville, NC USA: Society for Information Technology & Teacher Education. Retrieved April 25, 2019 from https://www.learntechlib.org/primary/p/30481/. Anderson, T. & Kuskis, A. (2007). Modes of interaction. In Moore, G. (Ed.). Handbook of Distance Education, 2nd ed, 295-309. Mahwah, NJ: Lawrence Erlbaum Associates, Publishers. Barbour, M., Kinsella, J., Wicks, M., & Toker, S. (2009, in press). Continuing change in a virtual world: Training and retraining teachers. [Special issue]. Journal of Technology and Teacher Education, 17(4), 437-458. Barker, K. (2002). Canadian recommended e-learning guidelines. Vancouver, BC: FutureEd. Barker, K., & Wendel, T. (2001). E-learning: Studying Canada’s virtual secondary schools. Kelowna, BC: Society for the Advancement of Excellence in Education. Beaudoin, M. (2007). Institutional leadership. In Moore, G. (Ed.). Handbook of Distance Education, 2nd ed, 391-402. Mahwah, NJ: Lawrence Erlbaum Associates, Publishers. Blomeyer, R. (2002). Online Learning for K–12 Students: What Do We Know Now? Napierville, IL: North Central Regional Educational Laboratory. Bonk, C., & Dennen, V. (1999). Learner issues with WWW-based systems. International Journal of Educational Telecommunications, 5(4), 401-417. Bonk, C. & Dennen, V. (2007). Frameworks for design and instruction. In Moore, G. (Ed.). Handbook of Distance Education, 2nd ed, 233-246. Mahwah, NJ: Lawrence Erlbaum Associates, Publishers. Technology and Teacher Education International Conference 2002, Nashville, Tennessee. Bradshaw, G. & Anderson, J. (1982). Elaborative encoding as an explanation of levels of processing. Journal of Verbal Learning & Verbal Behavior, 21, 165-174. Cavanaugh, C. (2002). Distance education quality: Success factors for resources, practices and results. In Discenza, R., Howard, C., & Schenk, K. (Eds.). The Design & Management of Effective Distance Learning Programs, 171-189. Hershey, PA: Idea Group. Cavanaugh, C. (2007). Student achievement in elementary and high school. In Moore, G. (Ed.). Handbook of Distance Education, 2nd ed, 157-166. Mahwah, NJ: Lawrence Erlbaum Associates, Publishers. Clark, T. (2007). Virtual and distance education in North American schools. In Moore, G. (Ed.). Handbook of Distance Education, 2nd ed, 473-490. Mahwah, NJ: Lawrence Erlbaum Associates, Publishers. Compton, L.K., Davis, N.E. & Mackey, J. (2009). Field experience in virtual schools – to be there virtually. [Special issue]. 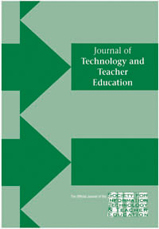 Journal of Technology and Teacher Education, 17(4), 459-478. Coppa, L. (2004). The ABCs of the k-12 virtual community. AACE Journal, 12(3), 343347. Davis, D. (2007). Developing text for web-based instruction. In Moore, G. (Ed.). Handbook of Distance Education, 2nd ed, 285-294. Mahwah, NJ: Lawrence Erlbaum Associates, Publishers. Davis, N. E., & Niederhauser, D. S. (2005). Socio-cultural analysis of two cases of distance learning in secondary education. Education and Information Technologies, 10(3), 249-262. Davis, N. E., & Roblyer, M. D. (2005). Preparing Teachers for the Schools That Technology Built: Evaluation of a Program to Train Teachers for Virtual Schooling. Journal of Research on Technology in Education, 37(4), 399-409. Dickson, W. (2005). Toward a deeper understanding of student performance in virtual high school courses: Using quantitative analyses and data visualization to inform decision making. In R. Smith, T. Clark, & B. Blomeyer, (Eds. ), A synthesis of new research in K–12 online learning (pp. 21–23). Naperville, IL: Learning Point Associates. DiPietro, M., Ferdig, R., Black, E., & Preston, M. (2008). Best practices in teaching K-12 online: Lessons learned from Michigan Virtual School teachers. Journal of Interactive Online Learning, 7(1), 10-35. Easton, S. S. (2003). Clarifying the Instructor’s Role in Online Distance Learning. Communication Education, 52(2), 87-105. Ferdig, R.E. (2006). Assessing technologies for teaching and learning: Understanding the importance of technological-pedagogical content knowledge. British Journal of Educational Technology, 37(5), 749-760. Ferdig, R. (2007). Teaching and learning literacy and language arts online. In Cavanaugh, C. & R. Blomeyer. (Eds.). What works in K-12 online learning, 49-66 Eugene, OR: International Society for Technology in Education. Ferdig, R. E., DiPietro, M., & Papanastasiou, E. (2005). Teaching and learning in collaborative virtual high schools. Naperville, Illinois: Learning Point Associates. Garrison, D. & Archer, W. (2007). A theory of community of inquiry. In Moore, G. (Ed.). Handbook of Distance Education, 2nd ed, 77-88. Mahwah, NJ: Lawrence Erlbaum Associates, Publishers. Graham, R. (1999). Unannounced quizzes raise test scores electively for mid-range students. Teaching of Psychology, 26, 271-273. Gunawardena, C. & LaPointe, D. (2007). Cultural dynamics of online learning. In Moore, G. (Ed.). Handbook of Distance Education, 2nd ed, 593-607. Mahwah, NJ: Lawrence Erlbaum Associates, Publishers. Hannum, W.H., Irvin, M.J., Lei, P.W. & Farmer, T.W. (2008). Effectiveness of using learner-centered principles on student retention in distance education courses in rural schools. Distance Education, 29(3), 211-229. Harms, C. M., Niederhauser, D. S., Davis, N. E., Roblyer, M. D., & Gilbert, S. B. (2006). Educating educators for virtual schooling: Communicating roles and responsibilities. Electronic Journal of Communication. 16(1-2). Haythornthwaite, C., Kazmer, M., Robins, J., & Showmaker, S. (2000). Community development among distance learners. Journal of Computer-Mediated Communication, September, 6(1). Hills, H. & Francis, P. (1999). Interaction learning. People Management, 5(1), 731-737. Hirtz, S. (2008). Education for a digital world: Advice, guidelines, and effective practice from around the globe. Vancouver, BC: Commonwealth of Learning. Holmberg, B. (2007). A theory of teaching-learning conversations. In Moore, G. (Ed.). Handbook of Distance Education, 2nd ed, 69-75. Mahwah, NJ: Lawrence Erlbaum Associates, Publishers. Hughes, J., McLeod, S., Brown, R., Maeda, Y., & Choi, J. (2005). Staff development and student perception of the learning environment in virtual and traditional secondary schools. In R. Smith, T. Clark, & B. Blomeyer, (Eds. ), A synthesis of new research in K–12 online learning (pp. 34–35). Naperville, IL: Learning Point Associates. Hutchings, P., & Shulman, L. S. (1999). The scholarship of teaching: New elaborations, new developments. Change, 31(5), 10-15. Kapitzke, C., & Pendergast, D. (2005). Virtual schooling service: Productive pedagogies or pedagogical possibilities? Teachers College Record, 107(8), 1626–1651. Keeler, C., Richter, J., Anderson-Inman, L., Horney, M., & Ditson, M. (2007). Exceptional learners: Differentiated instruction online. In Cavanaugh, C. & R. Blomeyer. (Ed.). What works in K-12 online learning, 125-141. Eugene, OR: International Society for Technology in Education. Kinash, S. & Crichton, S. (2007). Supporting the disabled student. In Moore, G. (Ed.). Handbook of Distance Education, 2nd ed, 193-204. Mahwah, NJ: Lawrence Erlbaum Associates, Publishers. Kleiman, G., Carey, R., Bonifaz, A., Haistead, E., & O’Dwyer, L. (2005). A study of the effectiveness of the Louisiana Algebra I Online Project. In R. Smith, T. Clark, & B. Blomeyer, (Eds. ), A synthesis of new research in K–12 online learning (pp. 36–39). Naperville, IL: Learning Point Associates. Lazarus, B. D. (2003). Teaching courses online: How much time does it take. Journal of Asynchronous Learning, 7(3), 47–54. Lee, J. L., & Hirumi, A. (2004). Analysis of essential skills and knowledge for teaching online. Association for Educational Communications and Technology, 7. Leinhardt, G. (1990). Capturing Craft Knowledge in Teaching. Educational Researcher, 19(2), 18-25. Lezberg, A. (2007). Accreditation: Quality control in higher distance education. In Moore, G. (Ed.). Handbook of Distance Education, 2nd ed, 403-417. Mahwah, NJ: Lawrence Erlbaum Associates, Publishers. Lowes, S. (2007). Professional development for online teachers. In Cavanaugh, C. & R. Blomeyer. (Ed.). What works in K-12 online learning, 161-178. Eugene, OR: International Society for Technology in Education. Moore, M. (2007). The theory of transactional distance. In Moore, G. (Ed.). Handbook of Distance Education, 2nd ed, 89-105. Mahwah, NJ: Lawrence Erlbaum Associates, Publishers. Muirhead, W. (2000). Online education in schools. The International Journal of Educational Management, 14(7), 315–324. Naidu, S. (2007). Instructional design for optimal learning. In Moore, G. (Ed.). Handbook of Distance Education, 2nd ed, 247-258. Mahwah, NJ: Lawrence Erlbaum Associates, Publishers. NEA. (2003). Guide to teaching online courses. Retrieved November 2, 2006, from http://www.nea.org/assets/docs/onlineteachguide.pdf. O’Neill, P. G. (1999). Teaching Effectiveness: A Review of the Research. Canadian Journal of Education / Revue canadienne de l’éducation, 13(1), 162-185. O’Neil, T. (2006). How Distance Education Has Changed Teaching and the Role of the Instructor. Paper presented at the E-Leader Conference. Olson, T., & Wisher, R. (2002). The effectiveness of web-based instruction: An initial inquiry. The International Review of Research in Open and Distance Learning, 3(2). Open and Distance Learning Quality Council. (2005). Standards in open & Distance learning. London, UK: author. Pajares, M. F. (1992). Teachers’ Beliefs and Educational Research: Cleaning up a Messy Construct. Review of Educational Research, 62(3), 307-332. Papert, S. (1980). Mindstorms. New York: Basic Books. Roblyer, M., & Marshall, J. (2003). Predicting success of virtual high school students: Preliminary results from an educational success prediction instrument. Journal of Research on Technology in Education, 35(2), 241–255. Roblyer, M.D. (2008). Virtual schools. Redefining a place called school. In G. Knezek and J. De Voogt, International Handbook of Information Technology in Primary and Secondary Education, pp 695-712. Rose, R. & Smith, A. (2007). Online discussions. In Cavanaugh, C. & R. Blomeyer. (Ed.). What works in K-12 online learning, 143-160. Eugene, OR: International Society for Technology in Education. Rovai, A. P. (2001). Building classroom community at a distance: A case study. Educational Technology, Research & Development, 49(4), 33-48. Russell, G. (2004). Virtual Schools: A Critical View. In C. Cavanaugh (Ed. ), Development and Management of Virtual Schools: Issues and Trends (pp. 1-26). Hershey, PA: Idea Group Publishing. Savery, J. R. (2005). BE VOCAL: Characteristics of Successful Online Instructors. Journal of Interactive Online Learning, 4(2), 141-152. Schnitz, J., & Azbell, J. (2004). Instructional design factors and requirements of online courses and modules. In C. Cavanaugh (Ed. ), Development and management of virtual schools (pp. 158–177). Hershey, PA: Information Science Publishing. Schoenfeld-Tacher, R., & Persichitte, K. A. (2000). Differential skills and competencies required of faculty teaching distance education courses. International Journal of Educational Technology, 2(1), 1-16. Schrum, L. (1998). Online education in the information age: A study of emerging pedagogy. In Cahoon, B. (Ed. ), Adult Learning and the Internet, 53-61. San Francisco: Jossey-Bass Publishers. Schrum, L. & Benson, A. (2002). Establishing successful online distance learning environments: Distinguishing factors that contribute to online courses and programs. In Discenza, R., Howard, C., & Schenk, K. (Eds.). The Design & Management of Effective Distance Learning Programs, 190-205. Hershey, PA: Idea Group. Smouse, T. (2005). Students with either specific learning disabilities or attention deficit hyperactivity disorder: Perceptions of self as learning in online courses at Florida Virtual School and in the traditional learning environment. Unpublished dissertation, University of Central Florida. Swan, K., Shea, P., Fredericksen, E., Pickett, A., Pelz, W., & Maher, G. (2000). Building knowledge building communities: Consistency, contact and communication in the virtual classroom. Journal of Educational Computing Research, 23(4), 359-383. Tallent-Runnels, M. K., Thomas, J. A., Lan, W. Y., Cooper, S., Ahern, T. C., Shaw, S. M., et al. (2006). Teaching courses online: A review of the research. Review of Educational Research, 76, 93-135. Tu, C. (2000). Online learning migration: From social learning theory to social presence theory in the CMS environment. Journal of Networked and Computer Applications, 23, 27-37. Von Secker, C. E., & Lissitz, R. W. (1999). Estimating the Impact of Instructional Practices on Student Achievement in Science (Vol. 36, pp. 1110-1126). Vrasidas, C., Zembylas, M., & Chamberlain, C. R. (2003). Complexities in the evaluation of distance education and virtual schooling. Educational Media International, 40(3), 201-208. Weiner, C. (2003). Key ingredients to online learning: Adolescent students study in cyberspace. International Journal on E-Learning, July–September, 44–50. Towards a Psychological Model for Learning in Avatar-based Virtual Environments: How Important is Spatial Processing?